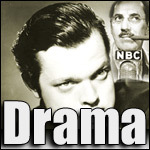 Bible drama was nothing new for radio -- NBC had tried the concept as far back as 1927. But it wasn't until The Greatest Story Ever Told came along in 1946 that Bible stories became a major success on the air. A dramatization of the life of Jesus (based on the book by Fulton Oursler, a former tabloid-newspaper editor who found greater success dealing with other topics), the program offered a straightforward and thoroughly ecumenical dramatization of scenes from the New Testament. It was narrated with supreme dignity by Norman Rose, and played out by a cast featuring such talents as Gale Gordon and Mercedes McCambridge. Goodyear Tire and Rubber sponsored the program for much of its run, but abstained from direct sales pitches, confining its credit to a simple mention at the start and finish of each broadcast.